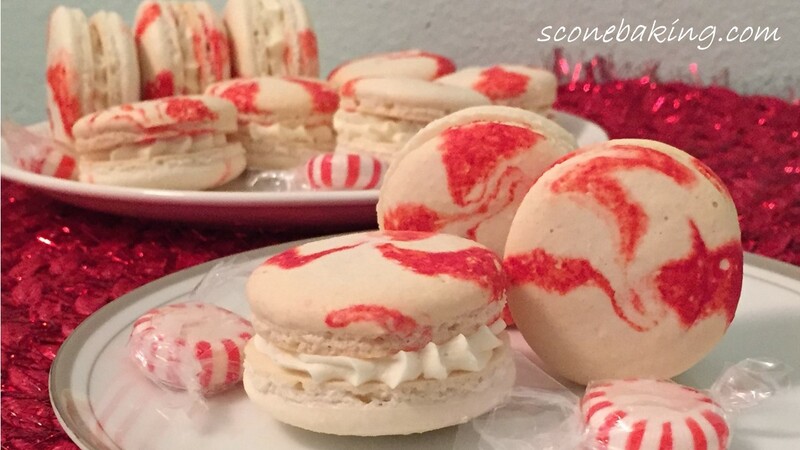 My friend Nori puts on a fun and festive Christmas cookie exchange with about 20 friends and family, where we enjoy fabulous food and creative cookies. 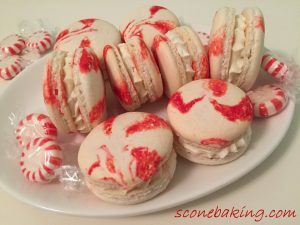 This year I wanted to bring something festive, so I decided to make my festive Peppermint Macarons. 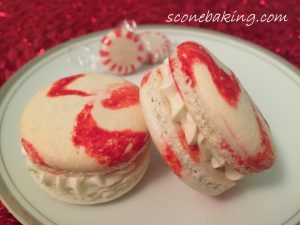 These festive Peppermint Macarons have peppermint in the cookie, and are filled with a yummy Peppermint White Chocolate Ganache. 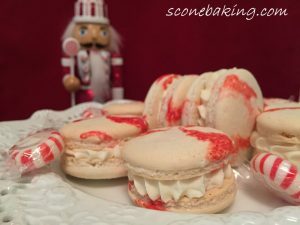 I also wanted these delicious macarons to remind everyone of Starlight Peppermint candies, so I gave them a red swirl. 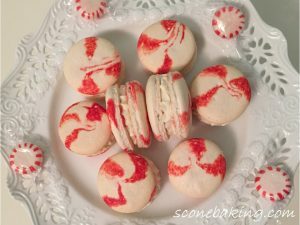 Here is my recipe showing you how easy Peppermint Macarons are to make. In a medium bowl, whisk together powdered sugar and almond flour. Sift mixture through a sieve into another medium bowl. Toss out any large chunks that won’t go through the sieve (about a pinch remaining). Set aside. 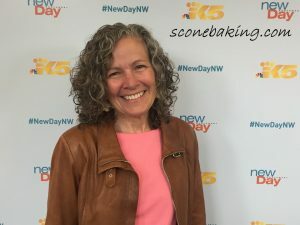 In a large mixing bowl with a whisk attachment, beat egg whites at medium speed until frothy; add cream of tartar, Whip until eggs start leaving a trail; slowly add castor sugar; increase speed to high. While the egg whites are at soft peaks, add 10 drops of white food coloring. Whip until stiff peaks form (when you pull out the whisk the peak should be stiff and not droopy, and you can hold the bowl upside down and nothing comes out.). Pour 1/3 of the flour mixture into the egg whites and gently fold in until incorporated. Continuing to fold in 1/3 of the flour mixture at a time, until it is completely blended (do not over mix, it should flow off the spatula like hot lava, and you can make a figure eight). On the computer make a template of 1-1/2″ circles about 2-inches apart, tape the paper together to get about 20 to a baking sheet (5 across by 4 down), place under parchment paper on baking sheet. Fit a 16″ pastry bag with a 1/2-inch round tip (#1A tip), using a coupler. Using a food grade paint brush paint 4 lines on the inside of the pastry bag from the tip to about 3 inches from the end of the bag. Carefully fill the bag with the batter. Using the template as a guide, pipe circles onto the parchment papers giving a 1/4 turn to give the cookies the swirl look. Remove template. Tap each sheet on the work surface to release trapped air bubbles. The peaks in the center should fall, if they don’t wet your finger, pat the down peak. Use a toothpick to release any air bubbles. Let the cookies stand at room temperature for 45-60 minutes to dry, which allows the cookies to develop their crusts. While the cookies are standing at room temperature, preheat oven to 320ºF. Once the cookies are dry to the touch, bake one cookie sheet at a time, at 320°F. for 13-15 minutes, until the top does not wiggly separate from the bottom (error on the side of overcooked). Cool slightly, remove from parchment (they should release, if not, use an offset spatula) Let cool completely. While cookies are cooling, break up white chocolate bar into small pieces into a medium mixing bowl. On the stove, warm up cream until edges simmer; add to white chocolate pieces and let sit for 1 minute. Blend chocolate until creamy. Add peppermint extract; blend until smooth. 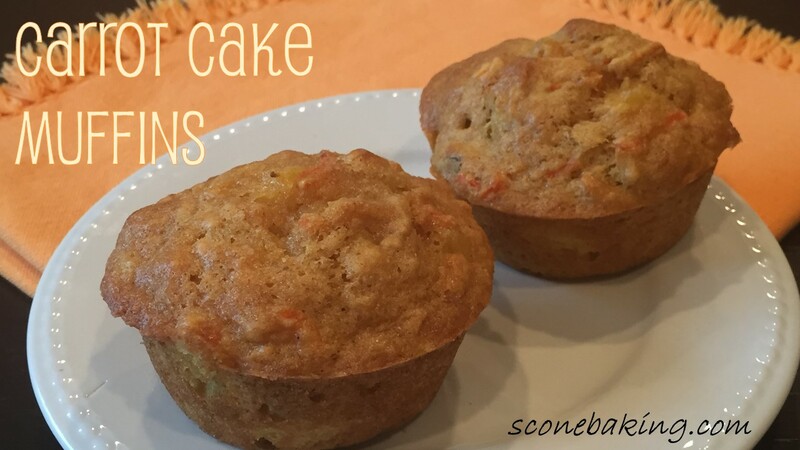 Place in the refrigerator for 20-30 minutes to cool and firm slightly. 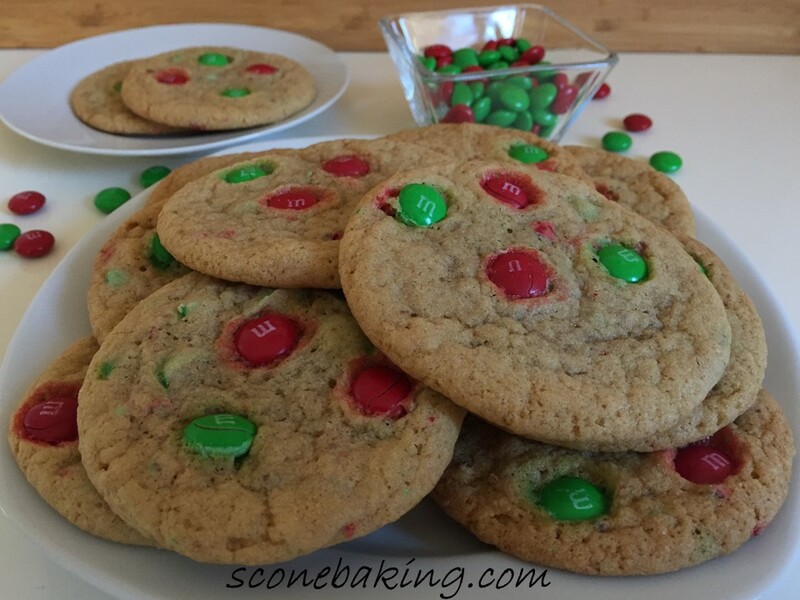 While chocolate is cooling, match up same size cookies with one top side up and the other filling side up. Remove the white chocolate ganache from the refrigerator, using a mixer, beat on medium speed until light and fluffy. Fit a 12″ pastry bag with a #32 star tip; fill bag with peppermint white chocolate ganache. 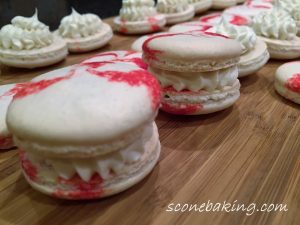 Pipe a dollop on each filling side up cookie. Press 2 cookies together until filling comes to the edge. Place in an airtight container, refrigerate for about 24 hours (so the shells absorb the flavor of the filling). Take the cookies out of the refrigerator 30 minutes before serving, to bring back to room temp.